6.The trainer is NOT INTENDED FOR USE BY CHILDREN. 7.For trying rotation type, please pay more attention to all above points. 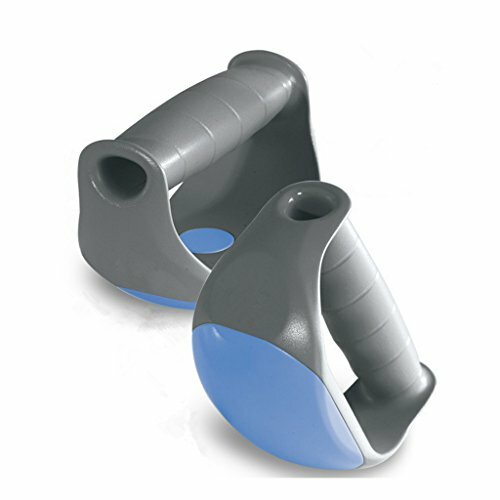 Patented design focuses on strengthening key muscle groups and increasing range of motion, provide rotation type and stationary type (two in one). The original rounded-bottom push-up equipment targets upper body and core muscles using stability forces. The frame adopts PP hard rubber, swivel using TPE soft rubber, strong bearing (400-Pound weight capacity), safety and eco-friendly, grip handles. Anti-skid handles make your exersice safe. The trainer is intended to be stable and freely rotate: It is stable when you try stationary type, you can use it as normal push up stands. When you try rotation type, start out using it on high friction surfaces (e.g., rubber gym mat, carpet, yoga or fitness mat) Do not use on hard surfaces until fully capable of doing so without injury. Lightweight (0.62lb) and compact, integrate into your home gym, fitness classes, yoga classes, etc. Easy to transport: ideal for all abilities. Perfect to do push up workout at home, at the gym, in a hotel room or anywhere else you desire. Suitable for all abilities, from the beginner to experienced athletes. Dimensions: 4.72in x 1.65in x 2.95in ; weight: 0.62lb ; When you buy today you will also receive:FREE mesh pouch. Makes a GREAT holiday gift for every fitness buff!! If you have any questions about this product by VANCIC, contact us by completing and submitting the form below. If you are looking for a specif part number, please include it with your message.